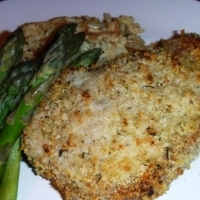 This pork chop recipe is quick, easy, healthy and tastier than those made with store-bought coating mixes. This recipe works equally well with bone-in or boneless pork loin chops (just adjust time according to thickness). Preheat oven to 400° F. Rinse and pat the chops dry with paper towels. Season chops with salt and pepper and coat each side well with the mustard. Combine the breadcrumbs, cheese, thyme and sage. Add a light drizzle of olive oil to the breadcrumb mixture and combine to coat. Place the chops into the crumb mixture, turning and pressing down to coat each side very well. Place on a baking rack set in a rimmed baking sheet or shallow baking dish. Bake until golden brown and done, about 20-25 minutes. Let rest about 10 minutes before serving. Did these last night for dinner. Delicious and so flavorful. Thanks for a nice recipe..